The short overview of our native apps and how it is beneficial.
" Useful, Simple & Fast Drivers App, Which makes you stay on the road! " Help's in delivering an order to its users on time, get the exact users location on the map, enables you to accept or reject an order with reasons/comments on the note, also facilitates you to auto-assign an order to some other drivers when rejected by a driver. Overall, it's an amazing app and time-consuming in delivering an order on time. Proven to be the best app for your business, since it helps you to manage your delivery smoother than ever, and helps your driver to get the exact location of your customer to deliver the order on time. It helps your driver to track the exact location on the map. Click here to know more about our delivery app.
" Your apps, your products & your brand "
Helps you to place an order with ease and faster than any other ordering app, it saves your details like address, contact no & card details to provide efficient and fast ordering flow, it's user-friendly and easy to use. Users app, which proves to be a useful & user handy way of placing an order in no time, using their smartphones, Only your users have to download the app and get the best use of it on placing an order when needed.It also helps your users to save your users details and card details. Click here to know more about our ordering app.
" Total control of your orders, just a few taps away! " Helps you to manage your business orders like a tech, accepting & rejecting an order is that that easy and smooth now with the business app helps you to leave a note if not accepted an order. It also facilitates assigning an order to any driver for its delivery. The business app, it will help you manage your business & orders efficiently within few clicks. This app helps your business owners to accept/reject orders efficiently & to assign an order to any driver for its delivery.Moreover, you can leave a delivery time after accepting an order so that to let your users know about its exact delivery time. Click here to know more about our business app.
" 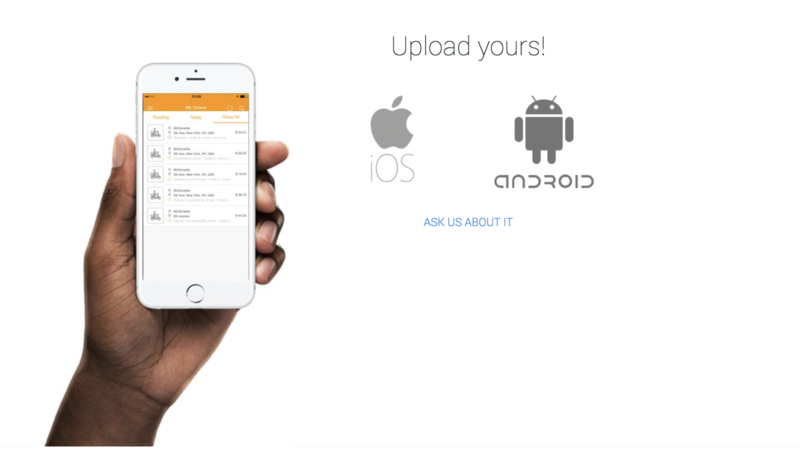 Give your business a personal touch with your own apps! " Helps you to create a separate ordering app for each of your business, with their own logo, images prices, & app icon, it makes ordering very smooth for any users without wasting any time. Helps you save your users details like name, address contact no, card details if any etc. Give you a great ordering experience. Ordering helps you to get each of your business with a separate app with their brand, logo & apps icon for ordering. Which makes each of your business a great new way to expand faster on the web, and thus helps your to get more & more online sales. Ordering single business app has its more added advantages like reaching to the targeted audiences who like to place an order from a particular store without searching for many at a time. It reduces your user’s search time. Helps you to concentrate your users on the store without being diverted to others similar business to get a service and much more. Click here to know more about our single business app. How can I upload my .apk file? Response: Read this link, to get some help. How can I upload my ipa file? "We hope this article has answered your question, if not, please use our live chat so we can help you right away"